On November 30, IADC announced the resignation of Stephen A. Colville as president and chief executive officer and the appointment of Jason E. McFarland as interim president, effective immediately. McFarland is a 20-year veteran of IADC, most recently serving as vice president since 2008 and chief of staff since 2013. The IADC Board of Directors recently elected Dr Tom Burke as its 2016 Chairman. Dr Burke currently serves as President & CEO at Rowan Companies. Additionally, Jack Winton, President – Operations for KCA Deutag, has been elected as IADC Vice Chairman during the IADC Board of Directors meeting held on 5 November in San Antonio, Texas. Scott McReaken, CEO of Sevan Drilling, will continue to serve as Secretary/Treasurer. Also continuing in their officer roles are Lyndol Dew as IADC Division VP, Offshore, and Mike Garvin as IADC Division VP, Onshore. Mr Dew currently serves as Senior VP of Worldwide Operations for Diamond Offshore Drilling, and Mr Garvin serves as Senior VP of Operations for Patterson-UTI. In a newly created officer position, Niels Espeland, President of International Operations for Grey Wolf Oilfield Services, will now serve as IADC Division VP, International Onshore. Mike Bowie, Sales and Commercial Leader for GE Drilling, was elected as IADC Division VP, Drilling & Well Services. Dr Burke was appointed Chief Executive Officer and elected a director of Rowan Companies in April 2014. He served as Chief Operating Officer beginning in July 2011 and was appointed President in March 2013. Dr Burke first joined the company in December 2009, serving as Chief Executive Officer and President of LeTourneau Technologies until the sale of LeTourneau in June 2011. From 2006 to 2009, Dr Burke was a Division President at Complete Production Services, an oilfield services company, and from 2004 to 2006, served as its Vice President for Corporate Development. Prior to that, he worked at McKinsey & Company and Schlumberger. Dr Burke received a PhD in Engineering from Trinity College, the University of Oxford, a Bachelors in Engineering with honors from the Heriot-Watt University in Scotland, and an MBA from Harvard Business School, where he was awarded a Baker Scholarship. On 6 November, during the IADC Annual General Meeting in San Antonio, David Williams was recognized as the 2015 IADC Contractor of the Year. During his acceptance remarks, Mr. Williams, Chairman of the Board, President and CEO of Noble Corp thanked all of the people he has worked with over the course of his career and IADC, urging more people from the drilling industry to participate in the organization. The IADC Contractor of the Year award was established in 1988 to recognize individual drilling contractors and their outstanding lifetime achievements in technical innovation, safety and economic efficiency within the drilling industry. Sponsored by National Oilwell Varco, the award is the only one in the industry reserved solely for drilling contractors. All recipients are nominated and selected by IADC member drilling contractors. Mr Williams has served in his current role at Noble since 2008. He previously served as Senior Vice President – Business Development of Noble Drilling Services from 2006 to 2007, as Senior Vice President – Operations of Noble Drilling Services and Senior Vice President and Chief Operating Officer of Noble. Prior to that, he served for more than five year as Executive Vice President of Diamond Offshore Drilling. Kenny Baker of Cactus Drilling was recognized as the recipient of the first IADC Chairman’s Anniversary Award during the IADC Annual General Meeting in San Antonio. The award was developed to recognize field-based individuals who have made a direct impact on improved performance for their company, either through a project or personal effort. It will be given every five years as part of IADC’s anniversary celebrations. The goal of the JIP is to develop the roadmap document, launch strategy and tracking systems. Mr de Wardt envisions a roadmap describing the next decade of potential development. Mr de Wardt reports that automated drilling systems have shown ROP increases of 40%, compared to human rotary drilling. Building and steering wells using automated systems produced an 80% improvement while sliding, he added. For more information about the DSAR JIP, go to IADC’s website, or contact Mr. de Wardt at john@dewardt.com. More than 80 drilling professionals turned out to learn about challenges and solutions to Extreme Drilling at the 11 November IADC Drilling Engineers Committee Technology Forum. The event was graciously sponsored by GE Oil & Gas in Houston. 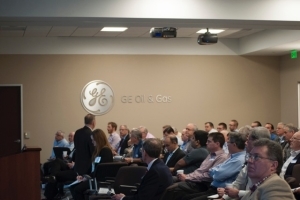 GE Oil & Gas graciously hosted the 4th Quarter 2015 IADC Drilling Engineers Committee Technology Forum. More than 80 drilling professionals attended for a morning of technical presentations and discussions. ERD Challenges – Mike Walker, ExxonMobil. The event also included a book signing by Mr Garcia and by Ron Sweatman, author of Well Cementing Operations, also par of the IADC Drilling Series. 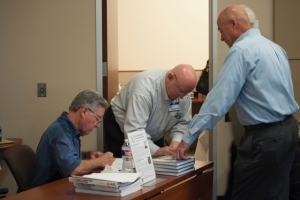 Juan Garcia, co-author of the “Drillers Knowledge Book”, left, and Ron Sweatman, author of “Well Cementing Operations”, sign their respective books for Tech Forum attendees. Approved presentations will be posted on the DEC website soon. Watch for an email alert. For more information about the Drilling Engineers Committee, contact Mike Killalea, mike.killalea@iadc.org, ext 222. Authored by noted expert Ron Sweatman with contributions and edits from some of the world’s most renowned drilling engineers, “Well Cementing Operations” is the most comprehensive and in-depth treatment of cementing ever published. Historically available only through experience or industry short courses, the information contained in this handbook is a valuable learning tool for readers at all levels and, for the first time, will be conveniently published in both hard copy and electronic formats. Published under the auspices of the IADC Technical Publications Committee, “Well Cementing Operations” is a must for the rig, office and classroom. The publication is available in hard copy and electronic formats via the IADC Bookstore. Or, call +1 713-292-1945 and ask for Loretta Krolczyk (ext. 215) or Jimmie Cobbin (ext. 209) to order. Click below to view an exclusive video interview with Mr. Sweatman. The final rule on occupational exposure to crystalline silica is expected to be released in February. The OSHA regulation would affect hydraulic fracturing operations which use silica sand to prop open shale passages, which allow hydrocarbons to flow through. The rule is estimated by OSHA to save 700 lives and prevent 1600 new cases of silicosis. Annual costs for implementation of the rule are estimated to total $664 million. Industry has noted that technologies are already available to reduce worker exposure to silica at hydraulic fracturing sites, and have noted that when properly enforced, the current limits effectively protects again silica-related disease. Managed pressure drilling (MPD) is on the cutting edge of oil and gas drilling technology. MPD, using a closed-loop approach to drilling, enables drilling of “undrillable” wells and has been used with success world wide. “DC Managed Pressure Drilling” is an anthology of recent articles from the highly respected journal Drilling Contractor, official magazine of the International Association of Drilling Contractors. This anthology covers IADC activities, case histories from around the world, shale drilling applications, modeling, MPD’s impact on well control, deepwater operations, assessing MPD candidates, dual gradient drilling, underbalanced drilling and more. Now available as an eBook from the IADC Bookstore. Or, call +1 713-292-1945 and ask for Loretta Krolczyk (ext. 215) or Jimmie Cobbin (ext. 209) to order. Rig Ways Training Center, Egypt (Conditional). Nabors Arabia, Al Khobar, Saudi Arabia.